Quaker Bookshop. What Canst Thou Say? Swarthmore Lecture 1980. Towards a Quaker Theology. Are Quakers Christian? Is it possible to be both Christian and Universalist? These are just two of the questions which form the starting point for this book. In exploring these questions, it becomes clear that they cannot be answered in isolation for they are linked to a whole complex of questions about Jesus, God and the nature of human living. So it vbecomes necessary to engage in theology. But for Quakers this must be from a distinctive Quaker standpoint which seeks to be both undogmatic and concerned with practical issues. Most of all it must be grounded in our corporate experince of God. 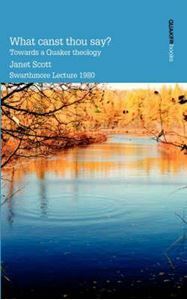 Janet Scott attempts to begin this process. She explores what we may say about Jesus and about God, sets out one way in whihc Quakerism may be both Christian and Universalist, and points out areas needing further discussion. "Silent worship can draw us into a deeper and more meaningful relationship with God. For this relationship to be successful it has to be made with complete and unreserved involvement..."
Writings from the major voices of the Quaker movement from the 18th to the 20th centuries.